ZeroList™ is a safety standard exclusive to PAÑPURI. It is a list of ingredients that are harmful the the skin, health and environment, with 2,300 ingredients that the brand prohibits in its products. The ZeroList™ sign appears on the packaging to ensure consumers that PAÑPURI’s Clean Beauty products are safe and effective. PAÑPURI also educates consumers about the effects of such harmful ingredients. In Thailand, there are laws and restrictions to control the use of harmful ingredients, as stipulated by the Thai FDA. 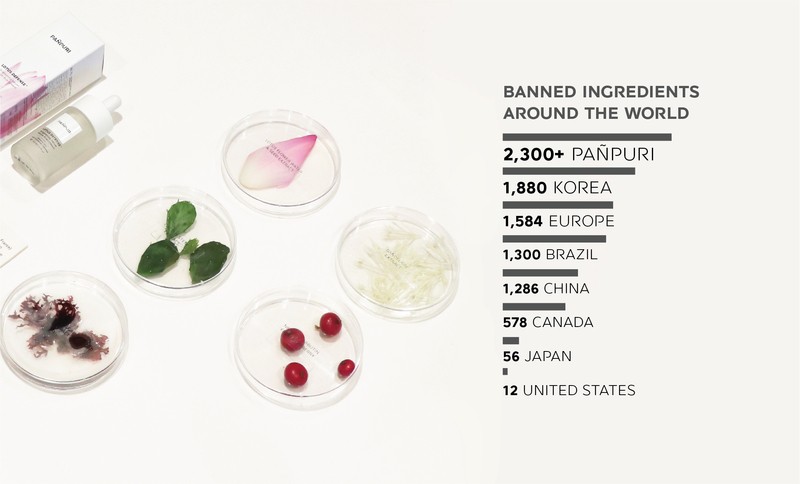 The list includes more than 600 prohibited ingredients. The same list contains 1,880 items in Korea, 1,584 in Europe, 1,286 in China, 56 in Japan and 12 in the US. 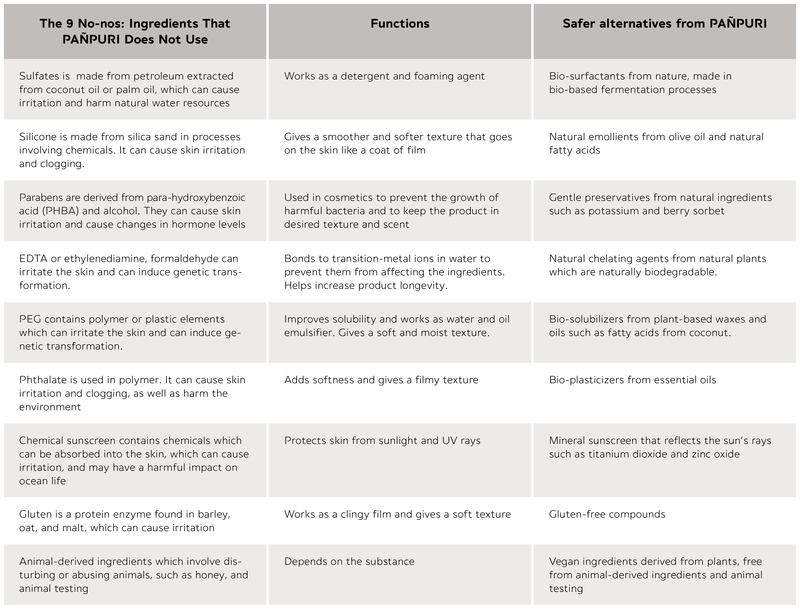 The ingredients in the ZeroList™ cover all those, and more, including ingredients that harm the human health and the environment, such as microbeads which can pollute the ocean and harm marine life, or titanium dioxide and zinc oxide in sunscreen which affects the environment and water sources. PAÑPURI’s Clean Beauty products are So Clean, So Green and So Effective! ZeroList™ is made of over 2,300 harmful or questionable ingredients. Here, PAÑPURI highlights the 9 NO-NOs under the ZeroList™. These harmful ingredients are not present in any PAÑPURI product. Some have been long known for their effects on the human health, causing cancer or leaving toxins in our body. PAÑPURI replaces them with safer natural alternatives which offer the same functions, only safer for you and for the world. The ZeroList™ sign appears on the packaging to ensure consumers that PAÑPURI’s Clean Beauty products are safe and effective.You can count on their safety and be assured that they are safe for the environment. Every product in this collection is tested and certified by SpinControl Asia (France). In a clinical study by SpinControl Asia (France) on 32 participants of all skin types. The results confirm the products’ effectiveness, and after four weeks of use, 100% of participants say their skin is significantly more radiant, healthier and brighter. 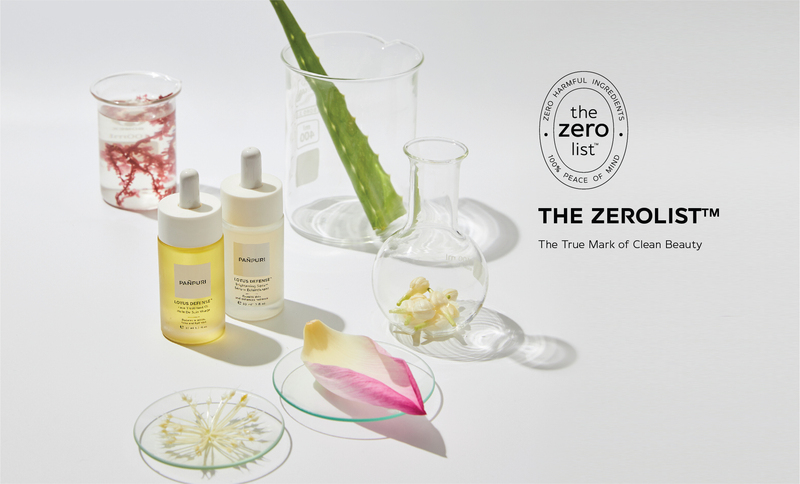 Therefore, the ZeroList™ sign appears on the packaging to ensure consumers that PAÑPURI’s Clean Beauty products are safe and effective.